It is teh awesome! I better be careful, Z. will want me to make her one! And Lava Girl is beautiful. Am impressed by your prowess as both pumpkin-carver and costume-creator! No--don't bow to consumerism. This is awesome and so much more memorable than store bought. That is an AWESOME costume!! Great costume! Lava girl is amazing...what are her super powers? Cute! You did an awesome job. Fantastic! Her little face says it all - you can see how thrilled she is! Well done - you could buy a 100 costumes but guess which one she'll remember forever? Wow, amazing work! I suspect if I tried to devise an outfit for P it would look like a cloth version of Frankenstein's monster. I think she might just be the most adorable Lava Girl ever. Now, that is a most excellent costume. And a very cute inhabitant of said costume! I am very impressed with your sewing skills. Although Violet looked great in her Wonder Woman costume, I kind of wish I could take credit for it's construction. well done on all accounts, M.
you are one talented mommy!!!! she in your creation is PREFECT! lovely! But the trick or treating really does take a toll, doesn't it? I feel like that's the price we pay for all that free candy. you MADE that?! wow. awesome. the thing that scares me about older kids is that i'm going to have to learn all the crazy characters just to send them out for Hallowe'en. That is the GREATEST picture! I love that you made this costume. I made one for Bitchy one year, and I vowed NEVER to do it again. HA!! God she's looking old these days! Sigh. Lucy wore eyeliner with her Pirate costume and looked old too. That's awesome, my kids love that movie. oh, it's wonderful! 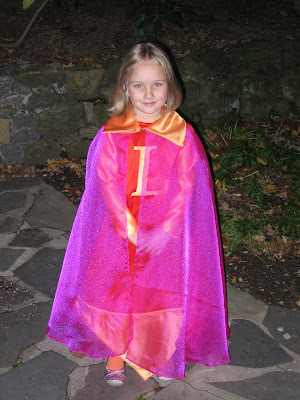 and i'm sure it was worth all the effort, despite the disappearing L.
Gorgeous, the costume and the girl. And you make a darling cute little girl, too! An excellent, beautiful costume!! I wish I had one just like it. Red would be seriously jealous. Great costume. And you went as Super Crafty-Mama, right? She's gorgeous and so is the costume!